This post lists the 20 publicly traded companies with the largest market capitalization as of today. Since my November 2017 list of the 20 most valuable stocks the value of 2 companies increased by more than $150 billion and 4 companies value decreased by over $100 billion. In the 20 most valuable companies list there are 13 USA companies, 4 Chinese companies and 1 each for Korea, Netherlands and Switzerland. 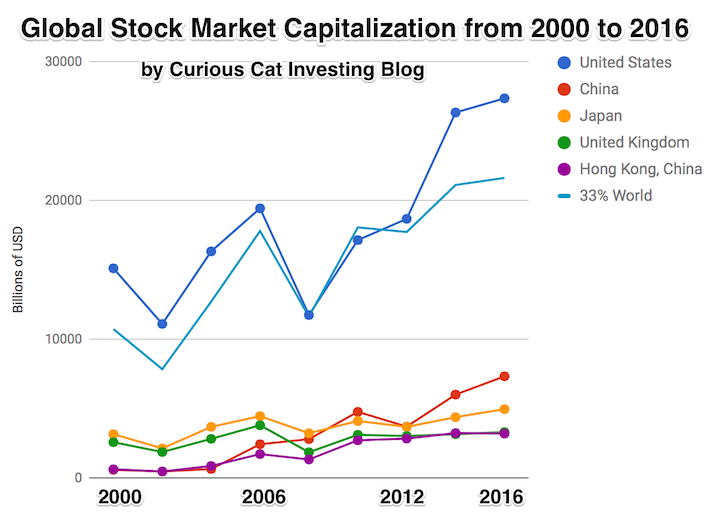 The remaining 15 companies with market caps above $200 billion are based in: USA 10, China 2, Switzerland 2 and Japan 1. Amazon soared $220 billion since my November 2017 post and became the most valuable company in the world. Microsoft soared $147 billion and became the most valuable company in the world briefly before Amazon took the crown. Apple lost $178 billion since my November 2017 post (after passing $1 trillion in market capitalization during 2018, up $100 billion from the November 2017 total, before declining). Facebook lost $118 billion off their market cap. Tencent lost $104 billion and Alibaba lost $100 billion in value during the same period. Google increased 8 billion (since my November 2017 post). Pfizer is the only new company in the top 20, growing by $37 billion to reach $249 billion and take the 19th spot (Wells Fargo dropped out of the top 20 and into 25th place). Between $255 billion (which earns 15th place) and $223 billion there are 13 companies with market caps very close to each other. I have written before about one of the most important changes I believe is needed in thinking about investing over the last few decades: Historical Stock Returns. My belief is that there has been a fundamental change in the valuation of stocks. Long term data contains a problem in that we have generally realized that stocks are more valuable than realized 100 years ago. That means a higher based PE ration is reasonable and it distorts at what level stocks should be seen as very overpriced. It also depresses expected long term returns, see my original post for details. The market was extremely well-behaved from 1935 until 2000. It was an orderly world in which to be a value manager: there was mean reversion. If a value manager was patient, he was in heaven. The market outperformed when it was it cheap, and when it got expensive, it cracked. Since 2000, it’s become much more complicated. The rules have shifted. We used to say that this time is never different. I think what has happened from 2000 until today is a challenge to that. Since 1998, price-earnings ratios have averaged 60 percent higher than the prior 50 years, and profit margins have averaged 20 to 30 percent higher. That’s a powerful double whammy. Diehard Ben Grahamites underestimated what earnings and stock prices would do. That began to be a drag after 1998. I believe he is right. I believe in the value of paying attention to historical valuation and realizing markets often go to extremes. However, if you don’t account for a fundamental shift in valuation you see the market as overvalued too often. The price-earnings and profit margin increases. Corporations got more monopoly power and more power in government. The current market era doesn’t feel like a bubble — it’s not euphoric yet like the housing bubble of 2005. It’s more that we have been climbing the wall of worry. So why have prices risen so high without a hint of euphoria — at least until very recently — or a perfect economy? My answer is that the discount rate structure has dropped by two percentage points. The yield on stocks is down by that amount and bonds too. The market has adjusted, reflecting low rates, low inflation and high profit margins. Again I agree. Our political parties have aided big business in undermining market through monopolistic market control and that has been consistent (and increasing) for decades now. It makes stocks more valuable. They have moats due to their monopolistic position. And they extract economic rents from their customers (granted they put a large amount of those ill gotten gains into executives pockets but even so they gains are large enough to increase the value of the stocks). On top of these strong forces we have the incredible interest rate conditions of the last decade. This is the one that is most worrisome for stock values in my opinion. It servers to boost stock prices (due to the poor returns for interest bearing investments). And I worry at some point this will change. There is also likely at some point to be a political return to the value of capitalism and allowing free markets to benefit society. But for now we have strong entrenched political parties in the USA that have shown they will undermine market forces and provide monopolistic pricing power to large companies that provide cash to politicians and parties in order to have those parties undermine the capitalist market system. I believe the stock market in the USA today may well be overvalued. I don’t think it is quite as simple as some of the measures (CAPE – cyclical adjusted PE ratio or market value to USA GDP) make it out to be though. As I have said for several years, I believe we are currently living through one of the more challenging investment climates (for long term investors seeking to minimize long term risk and make decent returns over the long term). I still think it is best just to stick with long term portfolio diversification strategies (though I would boost cash holdings and reduce bonds). And since I am normally light on bonds and high on stocks, for someone like me reducing stock holding for cash is also reasonable I believe (but even doing this I am more in stocks than most portfolio allocations would suggest). In Q1 2016, we repurchased 3.2 million shares of Alphabet Class C capital stock for an aggregate amount of $2.3 billion, of which $2.1 billion was paid during the quarter. The total remaining authorization for future repurchases is approximately $1.4 billion. The authorization has no expiration date. And they tout non-GAAP earnings, while of course reporting the GAAP earnings as required. One of the things executives like about non-GAAP earnings is they pretend the stock they give away to themselves doesn’t have a cost to shareholders. When you call attention to spending over $2 billion in the quarter to buy back 3.2 million shares it seems silly to then claim that the stock you gave away shouldn’t be considered as an expense. How can you pay over $2 billion just to get back the stock you gave away and also pretend that money is not really a cost? And on top of that you promote the buyback as evidence that the stock is really worth more than you paid (after all why would you pay more than it is worth). But when you give the stock away to yourself that shouldn’t be seen as a cost? It is amazing they can do this and think they are not doing anything wrong. And where does Google stand compared to last year for outstanding shares? 689,498,000 last year compared to 699,311,000 now. So nearly 10,000,000 more shares outstanding, even after they bought back 3.2 million this quarter. In the previous quarter there where 697,025,000 shares outstanding. All these figures are weighted-average diluted share balances for the entire quarter. Google CEO, Sundar Pichai, got a $100 million stock award in 2015 (before being promoted to CEO). After the promotion he will be taking an additional “$209 million in stock granted every other year (he has to stay at Google for four years after each grant to cash them out).” He was granted $335 million in stock in 2014 and $78 million in 2013. You can see how quickly the executives paying themselves this well (this is 1 executive, a highly ranked one but still just 1) can dilute stockholders positions even with multi billion dollar buybacks in a quarter. You don’t hear companies promoting how much dilution they are imposing on shareholders in order to provide windfalls for executives. I wonder why? No I don’t. I do wonder why reporters promote the buybacks and ignore the fact that the dilution is so extreme that it even overwhelms billions of dollars in buybacks. Alphabet reported $6.02 a share in earnings and $7.50 a share in non-GAAP “earnings” for the latest quarter. As I have said before I believe Google’s ability to extract enormous profit from their search dominance (as well as YouTube and adwords) makes it a very compelling long term investment. It would be better if the executives were not allowed to take such huge slices from the cash flow Google generates. But it is able to sustain those raids on stockholder equity and still be a good investment and appears likely to be able to continue to do so. Though I think they would be better off reducing the amount executives take going forward. The 20 publicly traded companies with the largest market capitalizations. Since my October 2015 list of the 20 most valuable stocks many of the market caps have declined significantly. Apple lost $131 billion in market cap since my October post. Alphabet (Google) lost just $1 billion in market cap, and for a short time moved past Apple into the top stop. Facebook achieved a rare increase during this period, gaining $16 billion and moving up 1 spot on the list. All the top 10 most valuable companies are based in the USA once again. Market capitalization shown are of the close of business February 26th, as shown on Google Finance. The 11th to 20th most valuable companies includes 4 USA companies, 3 Chinese companies and 3 Swiss companies. Toyota fell from 20th to 25th and was replaced in the top 20 by Verizon, which resulted in the USA gaining 1 company and costing Japan their only company in the top 20. Pfizer also dropped out and was replaced by Walmart. The total value of the top 20 decreased by $189 billion since my October post: from $6.054 trillion to $5.865 trillion. Since my October 2014 post of the 20 most valuable companies in the world the total value of the top 20 companies has risen from $5.722 trillion to $5.865 trillion, an increase of $143 billion. The companies making up the top 20 has changed in each period.